These ice cream waffles combine the taste of sweet and creamy vanilla ice with a thick layer of chocolate in a tasty waffle. 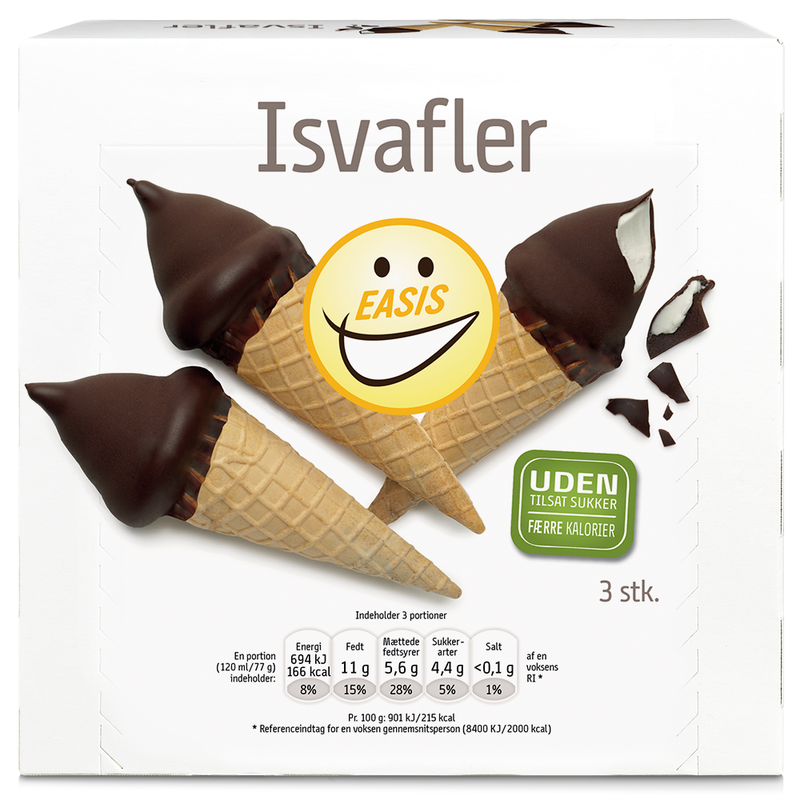 No sugar is added and the waffles contain 31% less calories than ordinary ice cream waffles. Waffles with vanilla ice cream and 15% chocolate couverture. Contains sweeteners. No added sugar, but with a natural content of sugar. Water, bulking agent (polydextrose), sweetener (erythritol 6.3%), vegetable fat (palm oil, coconut oil, rapeseed oil, shea oil), cocoa mass, WHEAT flour, skim MILK powder, dietary fiber (dextrin, oligofructose, inulin), cocoa butter, whey powder of milk, sweetener (maltitol), cocoa powder, fat-reduced cocoa powder, emulsifiers (mono- and diglycerides of fatty acids, lactic acid esters of mono- and diglycerides of fatty acids, SOY lecithin, polyglycerol polyricinoleate, sunflowerlecithin), stabilizers (sodium carboxymethylcellulose, guar gum, carrageenan, locust bean gum), antioxidant (disodium phosphate), citrus fiber, WHEAT starch, ground vanilla pods, natural vanilla flavor, salt, sweeteners (acesulfame potassium, sucralose, steviol glycosides), aroma (vanillin). May contain traces of egg, hazelnuts, almonds and pistachios. Storage: -18°C (-0,4°F) or colder. Do not refreeze after thawing. Net weight: 3 x 77 g (3 pcs). Net volume: 231 g (3 x 120 ml). Colli size: 8 x 3 pcs.